Endoscopy coupled with targeted resections represents a cornerstone in the diagnosis, staging, and treatment of patients with bladder cancer. Direct visualization can be challenging and imprecise due to patient-, tumor-, and surgeon-specific factors. We will review contemporary endoscopic technologies and techniques used to improve our ability to safely identify and resect malignant lesions in patients with bladder cancer. Enhanced endoscopic imaging technology may improve detection rates for bladder cancer throughout the upper and lower urinary tract, which may lead to improvements in recurrence and progression rates for non-muscle invasive bladder cancer (NMIBC). New techniques including narrow-band imaging (NBI), photodynamic diagnosis (PDD), Storz Professional Image Enhancement System (SPIES), optical coherence tomography (OCT), and others have shown benefit and may further improve our ability to detect and stage bladder tumors. Enhanced endoscopy technologies have already demonstrated value in improving the sensitivity of bladder cancer detection and early results suggest they may improve short- and long-term oncologic outcomes. A correction to this article is available online at https://doi.org/10.1007/s11934-019-0890-8. Shane Pearce declares no potential conflicts of interest. 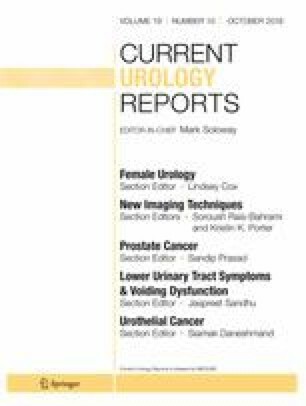 Siamak Daneshmand is a section editor for Current Urology Reports. •• Daneshmand S, Bazargani ST, Bivalacqua TJ, Holzbeierlein JM, Willard B, Taylor JM, et al. Blue light cystoscopy for the diagnosis of bladder cancer: Results from the US prospective multicenter registry. Urol Oncol Semin Orig Investig. 2018; available from: http://www.sciencedirect.com/science/article/pii/S1078143918301352. The authors of this study report outcomes for blue light cystoscopy (BLC) from a multicenter registry including over 1600 lesions from 533 patients. BLC improved the detection rate by 12%b for papillary lesions and 43% for carcinoma in situ. Twenty-five percent of patients had lesions detected only on BLC and BLC findings changed management in 14% of cases.